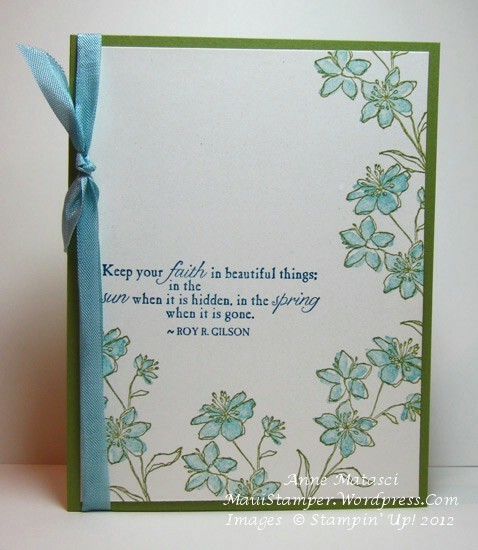 Recently I needed sympathy cards. I try to have one or two on hand, but I much prefer making just the right card. It allows me to create something just for the person who has lost a loved one, and I can also spend some time thinking about them and praying for them as they grieve. I considered adding pearls and other embellishments, but ended up rejecting all of that for the simplicity of the flowers. I folded the seam binding in half – it’s so soft that it takes that treatment easily and can still be mailed without extra postage. Lately, cards that can be mailed without extra postage have become more of a focus for me. I think twice before adding buttons, big brads and other heavy bling. I LOVE those embellishments – don’t get me wrong – but I mail a lot of cards and those extras create headaches at the post office. I’m keeping the 3-D goodies for hand-delivered cards, and there are plenty of those, too. The “brad” in the center is nothing more than a circle of cardstock covered with Crystal Effects, and I left off that girly-frou-frou ribbon stuff. Although these cards are similar in color and general style, the fact that they coordinate was more for my benefit than that of my young friends. As I thought of the two of them, putting these complimentary cards together gave me a little comfort. I hope it did the same for them. These are simply beautiful cards, Anne. Thanks so much for sharing them and your thoughts as you created them.